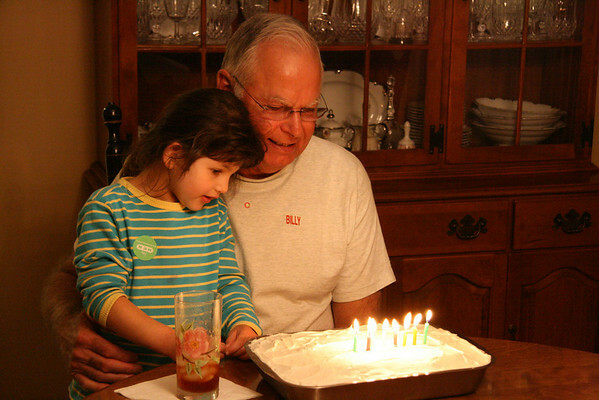 Last week we celebrated my dad's 68th birthday. Peggy invited us over for a yummy supper of roast and veggies, followed by scrumptious pineapple dream cake. As I was helping to clear the table and do some of the dishes, I came across something quite odd. I was about to toss some of the silverware into the dishwasher silverware caddy thing (pardon my technical lingo) and I was taken aback. Knives in one section, forks in another, followed by spoons then larger serving pieces. It was some sort of caste system. Is this just another area in which I am deficient? Should I be doing this? Is it too late? This is our dishwasher, partially filled with to-be-washed dishes (the politically correct term for dirty). It's every knife, fork, spoon or tong for himself. A hodge podge actually. Sometimes there is even a heavier contingent of silverware closest to the door because we are too lazy to open the door completely and pull out the rack. Categorize the silverware caddy thing? Nope, it's never crossed my mind. Until now. Now my curiosity is peaked and I am turning to you, my dear bloggy friends. How do you load your dishwasher silverware caddy thing? If you do follow the caste system, why? Do you have any other dishwasher quirks? My dishes are just lucky to get in the dishwasher! And I never criticize how Steve loads the dishwasher because I'm just happy when he does. But that's pretty cool that she is so organized. Hmmm, I usually just dump them in and just hope they all end up in the caddy. But I am intrigued. Nope, I'm a free spirit. I do try to de-categorize (pardon my made up word) the spoons on purpose so they don't stack one on top of another. I once had a good laugh with my MIL about how we load the dishwasher so differently. Things like this are so funny to me, too. LOVE your colorful fiesta dishes. I'm thinking of going multi-color one day. The sight of your dishwasher makes me a little giddy. I recently read somewhere that you're actually not supposed to do that. the silverware has a greater chance of resting in on itself and they won't get as clean. you're supposed to integrate, my friend! let's put a stop to silverwareism! every fork, spoon and knife for himself! Anna: The colors of our Fiesta truly save my sanity in the kitchen, I don't seem to mind the chores so much because everything is so colorful. Though I do see how it might save time when you unload the silverware. I love your fiesta, btw. At my house, it's also every knife, fork, spoon or tong for himself! Oh, and definitely more silverware closer to the door. I'm pretty particular about my dishwasher. I know how everything fits. If someone else loads it, I'm happy and I'm not going to move things around. However, if I load it, and I usually do, I segregate my silverware too. It makes it easier to put it away. I feel guilty everytime I put fiesta ware - which isn't very often- or ANYTHING I love in the dishwasher. I worry it's too hard on it- I'm nuts I know. 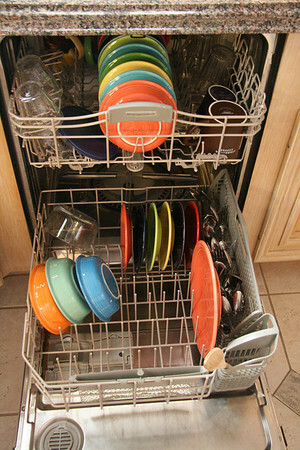 feista ware is so inexpensive these days & easy to replace, kind of... how does your's do inthe dishwasher after years? I am a little crazy about my fiesta ware- obviously. WHat? Who knew? I would never have the discipline to be that obsessive/organized!! Although it obviously would make unloading more efficient. Nope, ours, like you said, are mostly crammed in the front two sections. What a lazy bunch we are! OK...maybe I'm nuts, but I TOTALLy do that. It makes putting them away Soooooooo easy. That's why I do it. Not sure...however,I have enjoyed reading all the comments. I have heard you don't want to put your nicer silver washing next to the other things in your dishwasher-not sure why. That's the craziest thing I've ever heard of!! No offense to your sweet stepmother. I really would never have considered it. Though, it wouldn't surprise me if OCD Stie does that. ;-) I think your dishwasher is way cuter than mine EVER looks. Mine's a disaster. That's what a door is for. LOVE your feista! I have navy and yellow. But, I love all the different colors. Kids load the dishwasher. It's a jungle in there. I do that, and take it all a step further. I like to have an equal amount in each divider. I may have accidentally added clean ones to keep things equal. since the kids mainly do the loading and unloading I leave it pretty much to them (sometimes I will rearrange.) my daughter came up w/ that sorting arrangement some time ago. she said it was so that it was easier to put the silverware away. she mostly only cared about doing it that way when her day to load/unload was back to back! HA! No, my silverware just goes all over. Sometimes my bigger pampered chef nylon spoons, etc. get thrown on the top shelf. :) As long as it gets clean, I guess. I've seen the silverware caste system in action before but in our house all silverware is equal and integrated. I find if I put all the spoons in together they're more likely to fit snugly next to each other and not get clean so I purposely spread them out in the wash.
Moe is the Founder of Mansour Engineering Ltd. He founded the company in 1978, and has extensive experience in mechanical system design, temperature control system design, industrial facilities design and field analysis of mechanical systems. His experience includes new and retrofit design, facility engineering in hospital design, office buildings, high-rise buildings and special projects. His field experience with construction support and commissioning services has given him a comprehensive and practical approach to the solution of design problems.